I work with artists and designers who want to increase productivity in their studio practice. They have the desire to create meaningful work everyday and understand that why they create is fundamental to how they physically go about it. By increasing creativity in their lives, my clients learn how to achieve personal growth and reflection through art making. The tools of Japanese woodblock printmaking. Coaching became part of the winding path after finishing graduate school (YAY!) to find a lack in academic teaching positions in the Bay Area (BOO!). The inability to secure an academic teaching position highlighted a deep truth: I needed to help others create art. I started coaching artists and “non-artists” alike, and realized the powerful results of one-to-one and group coaching. To measure results of coaching my clients look at accomplished goals. Creating artwork presents a visual record, so my clients have clear markers for performance. As my clients grow in their studio practice and create fulfilling art, it drives me to create. Charles helped me print an edition from a linoleum block. My prints came out beautifully, and I also had a great time getting to know Charles and learning more about printmaking. I would recommend Charles to anyone who is interested in learning art- especially printmaking; he is positive, knowledgeable, and sensitive to his student’s needs. 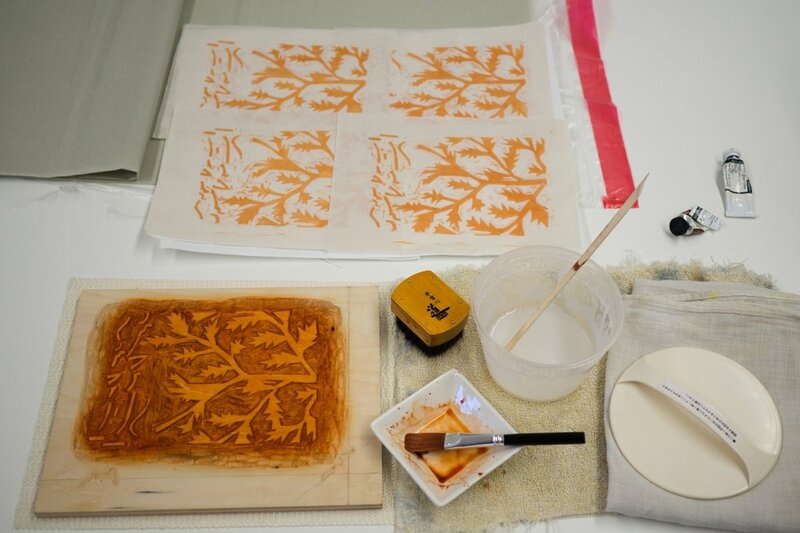 Artist Pantea Karimi pulls her first Japanese woodblock prints. Naomi Branz (Santa Cruz Artist) prints her linoleum block on the etching press.